The best thing about this property is it's location, there is no need to drive on a busy events weekend if you don't want to as you can simply walk out the door and you'll be town in 10mins. Located down a long driveway our home is tucked away from street traffic. Once you arrive you feel as though you're in another world. Use it as a base pad for busy weekends up the mountain or at an event or simply as a chill pad to come and relax and let the kids run free in the large section which wraps around the home. This property offers a place where you don't have to feel you have to be too precious about anything, it's bach living with the comforts of a home because it is our home! It's unique eclectic make up builds its fine but unrefined character. Because of the layout of living areas and bedrooms you can have plenty of people stay and it not feel as though you're tripping over each other. Extra guests will need to bring their own bedding, eg. air bed and sheets etc. You are welcome to stay on the floor but you MUST be honest with the amount of guests staying and you must include this number in your booking. For the safety of your young ones (or pets) the backyard is fully fenced but please check with us first before bringing your furry friends as the property is not suitable for all types of doggy personalities. There is plenty of off street parking, easily accommodating 6 vehicles. A fantastic log fire and wall panel heaters in bedrooms ensure a cosy warm house even on winter nights. You can choose to use our bedding and towels or bring your own. We ask that you simply leave the home as you found it when you leave as this is our family home. There is an extra cost to use our linen. The family cat and chooks add to the experience here. You can choose to feed them yourself or we can have that covered. The kids will love collecting eggs each morning! Pets allowed with prior approval. Families preferred. Please leave the property clean and tidy. The is absolutely NO parties allowed. You must let owner know how many people are staying and unless you have prior approval there is to be NO others on the property during your stay. I am a qualified Primary School Teacher. I am a wife and Mum to two amazing sons. Location, location, location. 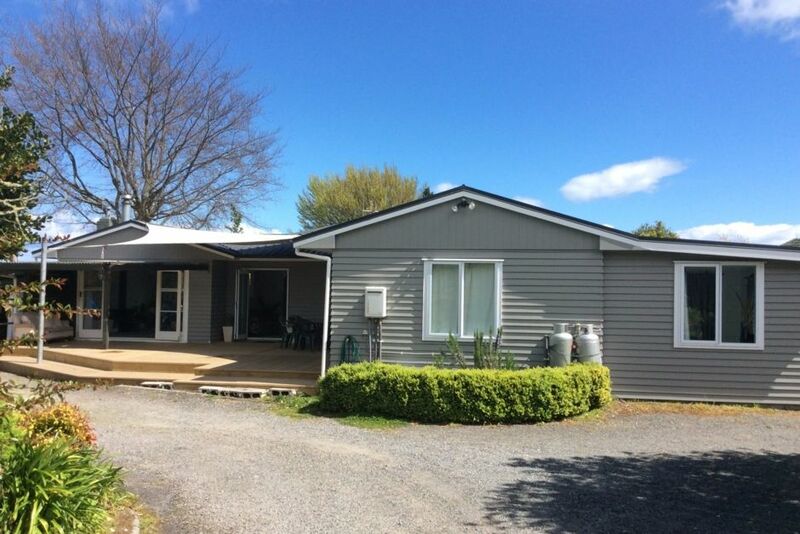 Our street is one of the most sought after in Taupo. Large entertaining deck. Plenty of room to spread your wings. Lots of lawn for a game of cricket. So close to the lake. Plenty of off sheet parking down driveway. The house was located within the lake and town. The house was located within the lake and town. Clean and tidy and spacious. The only problem was the bedding arrangements. I don't see how 12 people can sleep comfortably in this house, it is only a 3 bedroom home. Comfortable for maybe two small families. Apart from that everything else was fine. Really nice place close to town and the lake. Really nice place close to town and the lake. Property felt secluded, surrounded by great gardens. House is is well equipped and very comfortable. Thanks for your feedback and thanks for choosing our place for your holiday! Location is great and close to town and the lake. Location is great and close to town and the lake. Property is very spacious both inside and out and the wood burner fire place was great to have and hang around at night. Awesome home ,easy location ,quiet & relaxing home away from home.